Where does the time go? I have been nannying for two months now and I feel like I’ve become a mom. I am with the two kids about 40 hours a week and by the time I get home, I just want to crash on the couch and order take out. **Shout out to all those moms out there who don’t get to “clock out” at the end of the day! ** It’s a horrible habit but I can’t seem to break the cycle. I have, however, managed to make two of my fall favorites the past few weekends: pumpkin gingersnap cookies and curried celery root and roasted sweet potato soup. These are my favorite fall cookies that are easy but a bit time consuming. So many of my childhood holiday memories are connected to the cookies, pies and other baked goods my mom used to make around this time of year. Now that I am out on my own, I am trying to create some of my own holiday food traditions. I stumbled upon this recipe last fall when I had some extra canned pumpkin in my pantry. Gingersnaps were always part of my mom’s repertoire so I thought theses Pumpkin Gingersnaps would be the perfect addition to mine. In the bowl, beat the butter and sugar together until creamy and smooth using a hand mixer (or a standing mixer if you have one). Add the pumpkin, molasses, egg, and vanilla extract, mix until well combined. In a medium bowl, whisk together flour, baking soda, spices, and salt. Add dry ingredients to wet ingredients and mix until combined. When you are ready to bake, preheat oven to 350° F. Line a baking sheet with a Silpat or parchment paper. Place sugar in a small bowl. Roll tablespoon-sized balls of dough in sugar until well coated and place on prepared baking sheet, about 2 inches apart. Bake for 10–12 minutes, or until cookies look cracked and set at the edges. The cookies will still be soft. Let the cookies cool on the baking sheet for a 2-3 minutes after removing them from the oven, then transfer to a wire rack to cool completely. *I cannot stress enough how important it is that you let the dough chill for AT LEAST one hour. I usually leave mine overnight. If you attempt to roll the dough in your hands and sugar before it is properly chilled, you will have a frustrating sticky mess on your hands (literally). The longer the dough chills, the easier the rolling will be! This next recipe is loosely on Mark Bittman’s Creamy Curried Celery Root Soup. Preheat the oven to 350 degrees. Put sweet potato in a large bowl and coat with 1 tablespoon of oil and 1/2 tablespoon of curry powder. Toss to coat. Spread out on a lined cookie sheet and roast in the oven for 25-30 minutes (it might take a little longer so just check in 3-5 minute increments). Cool the roasted sweet potato and the cooked celery root cool slightly. Add both to a blender or food processor, and purée carefully. You may also add the sweet potato to the celery root, stock and spices and use an immersion blender to purée the soup in the pan. These recipes have become a part of my fall/holiday tradition and I hope you will try them out. They are a little tricky at first but practice makes perfect! Once you get a hang of these, they will be great fall backs when you’re in need for a fall pick-me-up! Enjoy! If you’re looking for some fall inspiration, check out this list of seasonal fall fruits and vegetables and some other fall recipes, in this from Buzzfeed! I posted this picture yesterday and promised a recipe. This is more of a recommendation that you should take with a grain of salt. Feel free to experiment with the flavors and make it your own! My mom and I had this at Europa in Richmond, Virginia a few years ago when she was visiting me at college. This great tapas spot became a favorite of mine of the years and this gazpacho was a highlight. My mom asked the chef for the recipe. He said he didn’t have a recipe, per se, because he kind of winged it but he was able to give us a list of ingredients. From their, my mom has tweeked it as needed and here’s what she has come up with! I might try roasting the poblanos down the road but there is something to be said about the fresh, raw flavors these ingredients add the dish. Cut the watermelon in half and scoop the watermelon “meat” from one half and put it in your food processor. Pulse until you have a smooth puree/juice. Put aside in a bowl or pitcher. 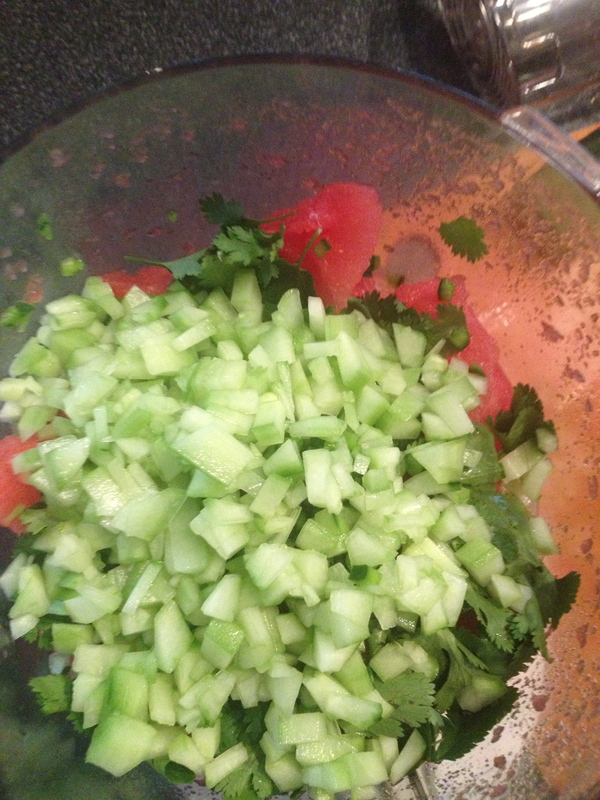 Cut up the rest of the watermelon and put it in the food processor. Add cilantro (no need to chop). Peel cucumber and cut lengthwise. Using a small spoon, scrap the seeds out of the center of the cucumber. Chop roughly and add to the food processor. Cut the top off of the poblano, scrap out the seeds and remove the membrane (this helps remove some heat). 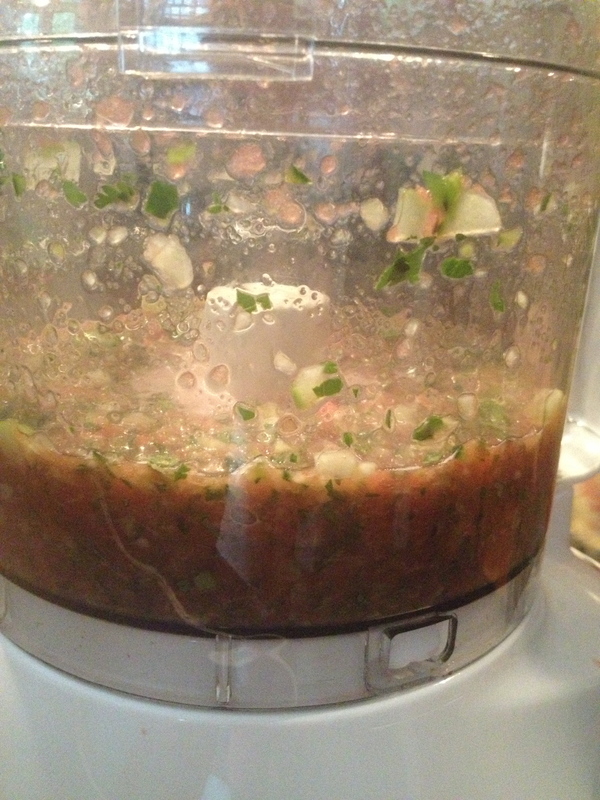 Chop the poblano roughly and add to the food processor. 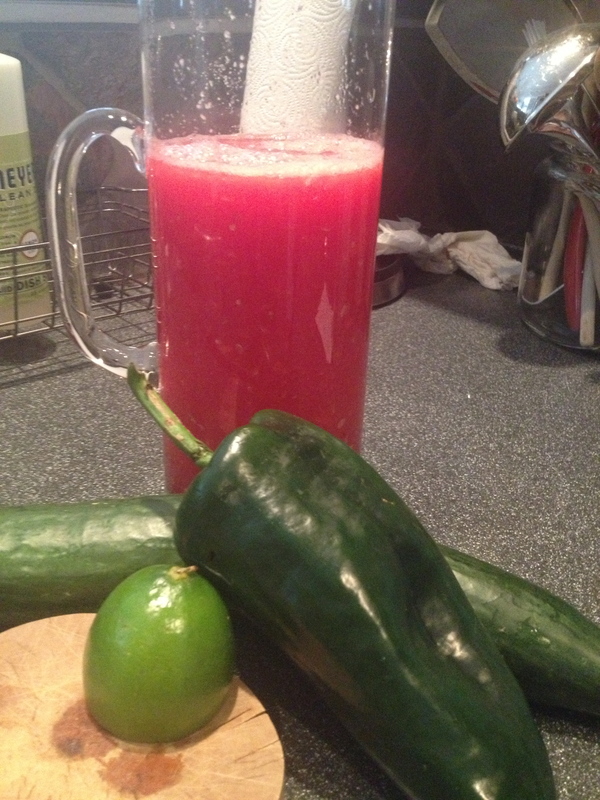 Add fresh lime juice and pulse until it looks like the picture above. 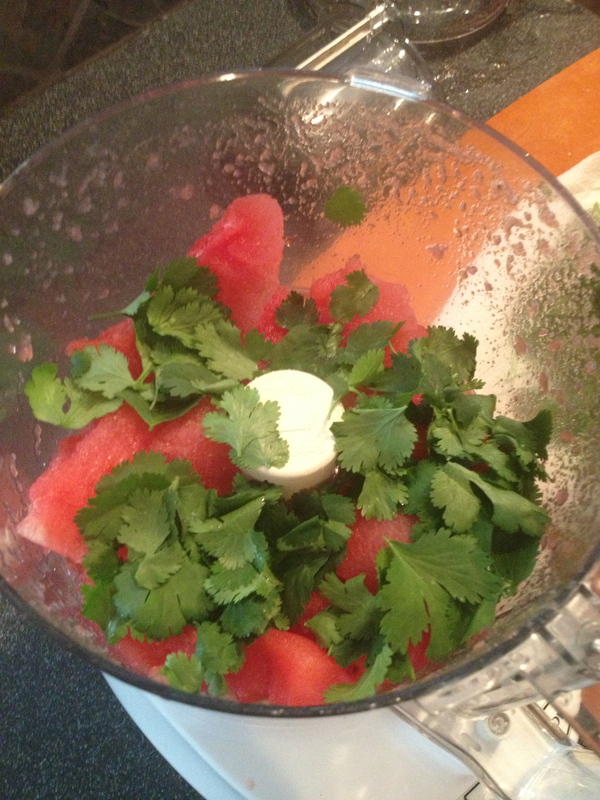 In a large bowl, combine the reserved watermelon puree/juice and the mixture of watermelon, cilantro, cucumber, poblano pepper and lime juice. Season with salt to taste. Start with a small amount and taste of each addition of salt until you are happy with the flavor. The gazpacho should be served chilled. Chill in the refrigerator for at least 2 hours before serving. 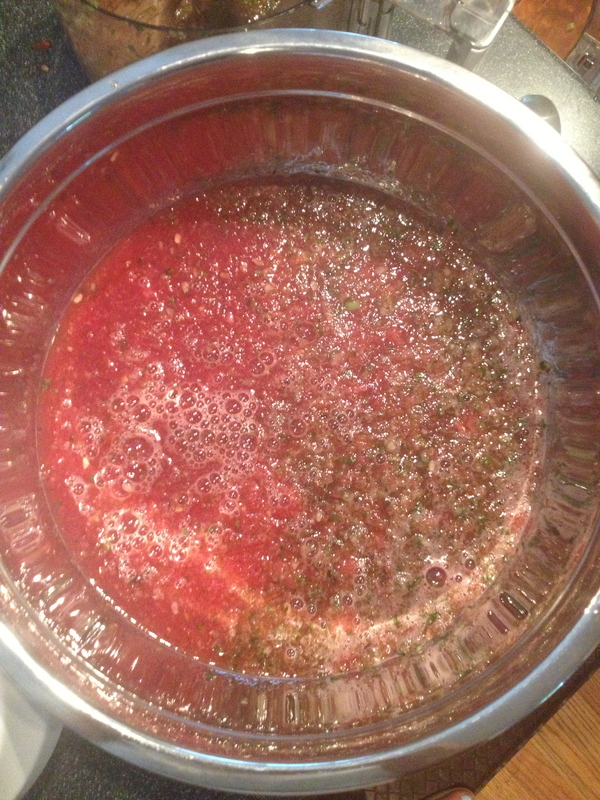 Leaving it over night is best- it will be thoroughly chilled and it will give the flavors a chance to meld together. Serve as an appetizer or entree by adding some croutons! 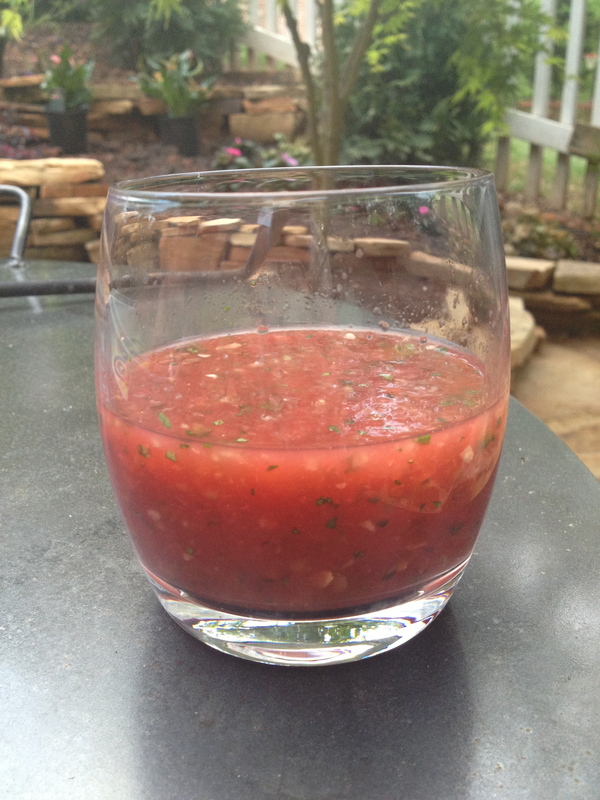 My mom and I made watermelon gazpacho today and its such a great, refreshing summer appetizer. I will definitely be making this this summer! Look for a post about it soon!! Anyone who has done WW has probably tried their 1 point vegetable soup. I remember my mom making it when we decided to do WW together when I was in the 8th grade. It was the perfect afternoon snack to get me through until dinner- chalk full of veggies (fiber) and it didn’t break the (WW point) bank. That was about 12 years ago and WW has changed. The program is no longer using calories as part of the point calculation (anyone else remember those point sliders where you had to match the calories with the fiber and fat?) and now almost all fruits and veggies are ZERO POINTS! Since joining WW in July, I have seen a lot of changes on their website including some revamping of old WW favorites. 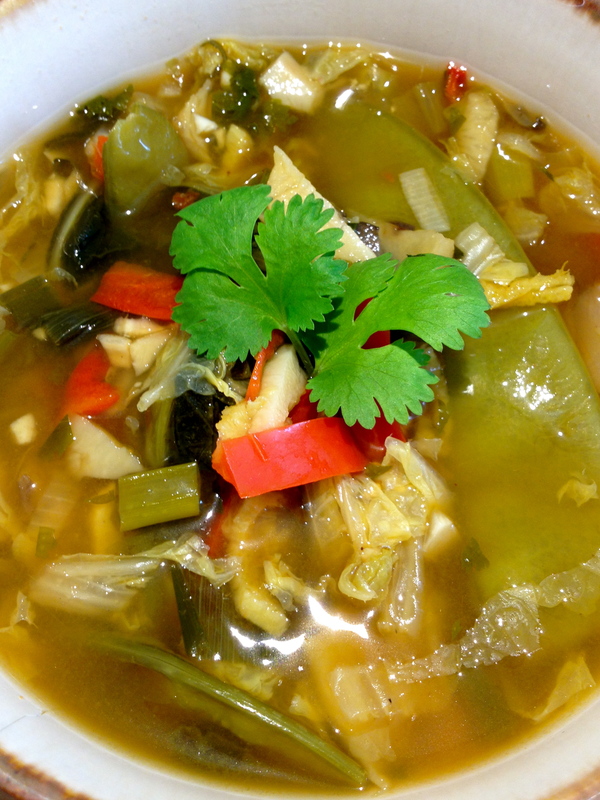 I stumbled upon this Asian-inspired veggie soup and knew I had to try it. I lived in Southeast Asia for 5 months in college and I fell in love with the way the Vietnamese used veggies for extra texture and flavor so I knew this soup would be delicious! I was hesitant to make it at first because some of the vegetables in the recipe can be hard to find and I didn’t want to travel all over NYC or all the way down to Chinatown to find everything. Also, the whole “fresh herbs” debacle- is it really worth buying the fresh herbs when you only use 1/2 cup? Stir in soy sauce and cilantro (and Sriracha, if you’re using it). Yields about 1 cup per serving.